Part finder Friday! 32Khz timer crystals for RTCs or power-saving microcontrollers « Adafruit Industries – Makers, hackers, artists, designers and engineers! 32Khz timer crystals for RTCs or power-saving microcontrollers. 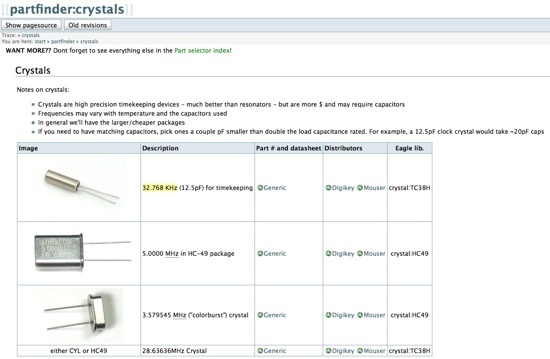 If you have any sort of real time clock, they’ll want one of these 32 khz crystals. They are not temperature compensated so you may want to do that in software. All this in the part finder! Use it, live it, love it! I’ve got a couple of those real-time crystals I obtained at some point in the past, and they’re in the same package as the one you picture above. Cylinder shaped. Any idea why that seems to be the most common package for that frequency of crystal, rather than the rounded box kind of shape used in most other through-hole crystals? Inventorjack: The reason probably has something to do with the fact that these crystals are used in watches, where space — especially height — is really critical. The part design is quite versatile allowing for example to embed the crystal in a slot in the PCB. Newer 32.768 kHz crystals often have a square cross-section, they are probably better suited for automated soldering.